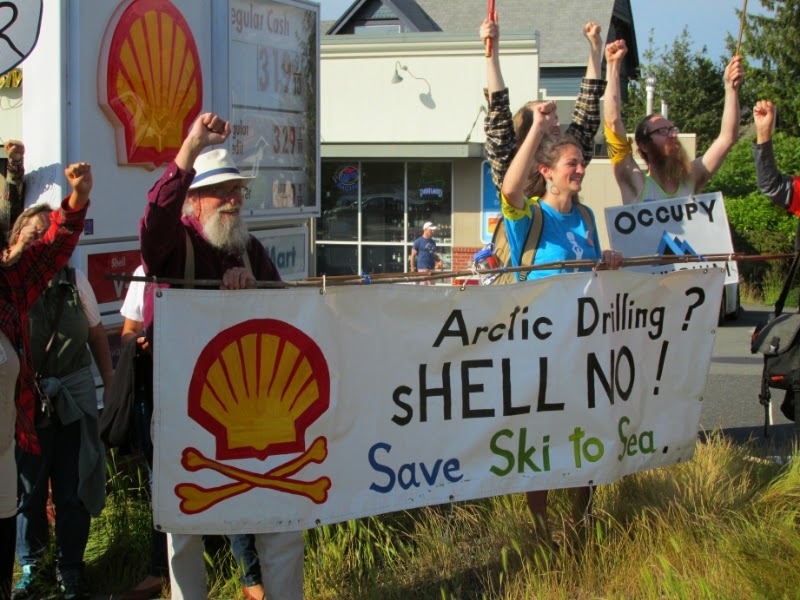 Taking protest against oil drilling in Arctic Ocean to the consumer end of the equation. The filling station on Holly Street. Protest in Bellingham also addresses the lack of snow for our annual Ski to Sea Race. The ski leg of the relay has had to be cancelled in 2015, due to practically no snow on the course. Protest started at the regular Friday vigil by Federal Building. Then it proceeded to Shell Station on Holly where it provided a good photo op to remind consumers of their role in the oil economy as well. After that, it headed to Bellingham waterfront near a rig that is being readied in Bellingham Bay to help with the oil drilling. Protest in Bellingham was on May 22 2015 after a similar protest in Seattle where hundreds of kayaks were seen around a drilling rig being worked on in Seattle harbor. See link to my photos on Flickr.